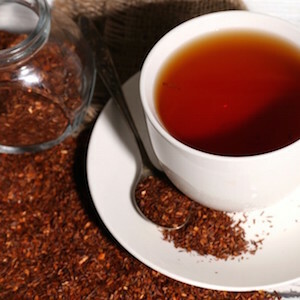 Rooibos tea, also sometimes referred to as red bush tea, is gaining in popularity. This is partly due to its rich, nutty flavor, but also for its powerful health benefits. Rooibos tea comes from a plant called Aspalathus linearis, which is native to parts of South Africa. It is one of the only naturally caffeine and tannin-free tea and contains a large dose of antioxidants and beneficial nutrients in every serving. People often drink tea when they are interested in maintaining or improving their health. If this is the case, you may want to learn more about Rooibos tea, before you pick up another box of black or green tea bags. 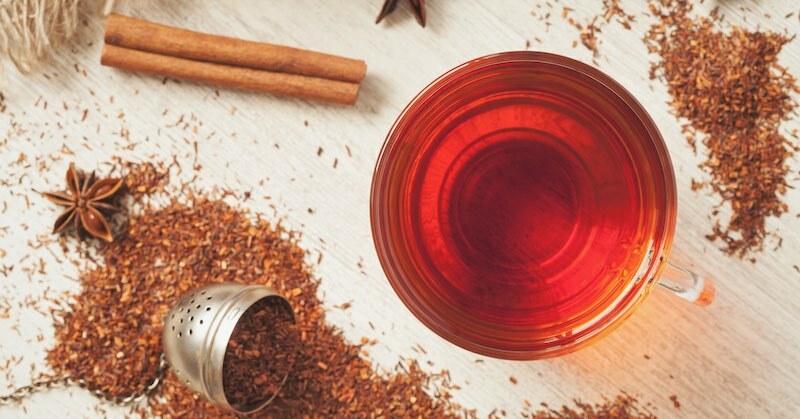 Here are 7 health benefits of Rooibos tea, followed by a simple recipe for preparing Rooibos tea juice. One of the greatest health benefits of this tea is the fact that it is packed with nutrients. Each serving will provide you with a healthy dose of zinc, copper, iron, calcium, magnesium, manganese and potassium. Some of these nutrients are lacking from most people’s diets. If you have been feeling fatigued or experiencing digestive discomfort, you may be lacking nutrition, which Rooibos tea can help supply. Drinking Rooibos tea can help promote a healthy digestive system. It contains anti-spasmodic properties which may be able to help soothe common digestive issues, such as vomiting, nausea, and even acid reflux. Rooibos tea is also full of anti-inflammatory properties that can help fight the signs of aging and protect your skin. By reducing inflammation, you may be able to get relief from eczema, rashes, and sunburn. Rooibos tea can also help your skin retain its elasticity and could possibly prevent acne. For hundreds of years, people have rubbed Rooibos leaves along their body to heal burns and rashes, and prevent skin irritation. Drink Rooibos tea to fight allergies and respiratory disorders. Rooibos tea contains polyphenols, which are a type of antioxidant and also contain anti-inflammatory and anti-viral properties. For this reason, it is believed that Rooibos tea can help people deal with symptoms related to allergies and respiratory issues. Protect your body against harmful free radicals. Rooibos tea may contain up to 50% more antioxidants than green tea. This helps to fight free radicals that are known to increase the risk of cancer, heart disease, and various diseases related to aging. Many people enjoy the naturally sweet flavor of Rooibos tea. It is stronger than green or black tea, so you should not have to add any sweeteners. If you want to add a splash of flavor, you could try adding a bit of fresh lemon juice that will enhance the taste and nutrients absorption. You may not realize this, but most teas contain just as much caffeine as coffee. Too much caffeine can increase your heart rate, stress levels, and anxiety. Rooibos tea is one of the only teas that is naturally caffeine and tannin-free. You can drink it without experiencing the jitters that sometimes come with caffeine consumption. Simply combine the ingredients in a blender until smooth. The honey is optional, but it can help blend the flavors of the tea and the orange juice together. While you may not have heard of Rooibos tea before, it is a powerful drink that can help with a wide range of health issues. It does not contain any caffeine nor tannin, and is a nutrient-powerhouse. The abundance of antioxidants help cleanse your system while the other vitamins and minerals can protect against signs of aging, improve your digestion, and promote better health. Consider picking up some Rooibos tea the next time you visit the grocery store.